Induldging in some red today, some lovely deep, shimmery red that came in a bottle with Stargazer 315 written on it. Mmmmm. Stargazer 315. A good red. I do like this red and I'm not really a red polishy person. But the colour on this is divine and very well pigmented, needing two coats for full opacity but you might get away with one. This may make a good stamping polish as well, shall put that to the test. 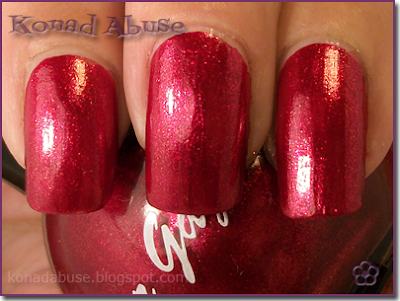 The finish looks a bit metallic but has a shimmery shimmer to as well, and was it mentioned that I do like this red? Again, I'm trying out some stuff suitable for occasion where I have to wear a dress (OWIHTWAD for short). Not bought the dress yet, BTW, I'll probably end up getting a dress that matches me nails at this rate. Plus I don't know what colour to have my hair ... anyway, there was a stamping idea for the OWIHTWAD. 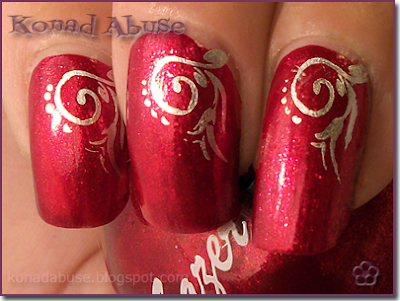 These swirly-whirly flowery designs are off the HB-52 plate and the stamping polish is Stargazer Chrome 232 (silver). A bit of topcoat went over the top and bish-bosh, job done. I quite like this one which means it will quickly be ruined. I like this stamping! I think it should be great for the OWYHTWAD. Ooee ooee. That red has a foil quality to it. Niiice. @Laura It is a very strong contender for the OWIHTWAD, especially the colour.